Greencork is hiring for a host/cashier. They’re looking for someone who is friendly and outgoing, and who is comfortable with learning new technology. Message us, call to inquire, or apply in person! (Cooper-Young; click FB tag for address). Old Navy is currently hiring for early morning: 5 am -10 am Sunday-Thursday at the Poplar Plaza and Wolfchase locations. If interested, go online to www.oldnavy.com and select careers. 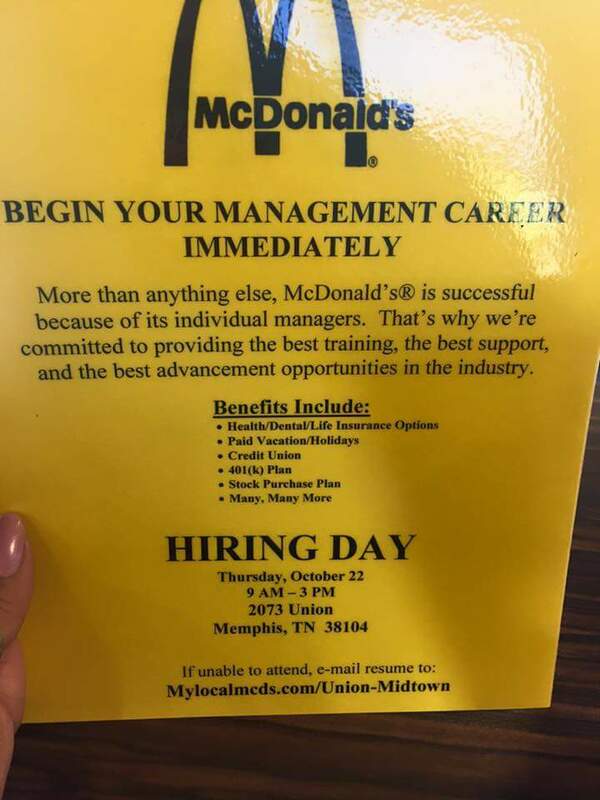 Hiring Day for McDonald’s Management, 2073 Union Ave. October 22nd from 9a-3p.